There is no question you have the best. 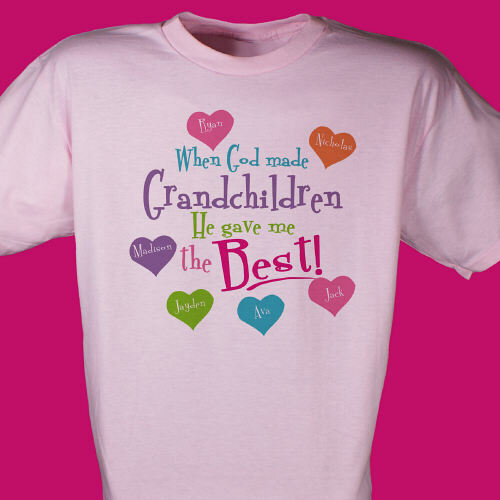 Thank God with Personalized Grandma Shirts celebrating the warmth, love and support provided by Nana, Grandma, Gram, Granny or Mom. 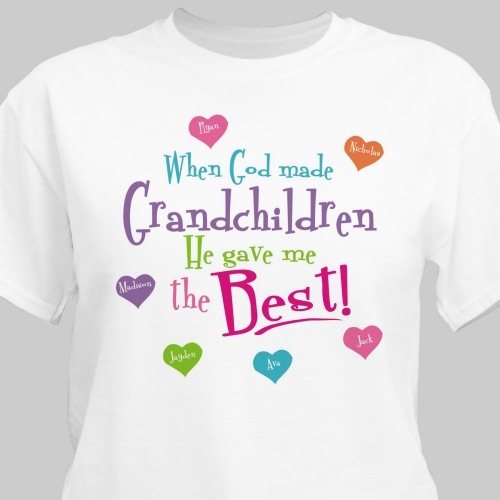 Now your very important Nana can proudly show off the whole family on her attractive personalized T-shirt. Your Personalized T-shirt is available on our premium white 100% cotton T-shirt, machine washable in adult sizes S-3XL. All of our personalized shirts include FREE Personalization. Create your own Personalized T-shirt with up to 30 names and any title. Love the shirt, thank you! I love the shirts so much I’ve been buying them for family members too! Love my new T-shirt! Good quality, all around great service. Thank you so much. -- GREAT CUSTOMER SERVICE! -- Lovely item, Gildan brand tee (which is thick & of good quality), all the names were correct, great coloration. I contemplated a 4-star rating because I felt that the printing could have been just a hair sharper and/or larger; the names are a tad too small. 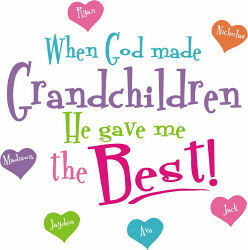 I ordered two of these tees, for myself & the other grandmother. My tee had a small defect where one of the hearts was missing about 1/4-inch along the side. I emailed the company & they replied promptly the next business day with cheerful regrets for the defect & a free order for a new tee. Because of their outstanding customer service, they get 5 stars. I'll definitely be shopping with them again!